Published: Apr 24, 2013 to ? Weak, clumsy, and shy, Tsukushi Tsukamoto is a prime target for bullies. Though he suffers through their torment, it leads to a fateful encounter with fellow Seiseki High School student Jin Kazama, a genius soccer player of the same age. After saving Tsukamoto from the bullies, Kazama invites him to a futsal match since his team is one man short. Although he struggles to keep up with the more experienced players, Tsukamoto is passionate and persistent; not even an injured foot stops him from running around the field. His endless runs and continuous efforts inspire the team, particularly the unmotivated Kazama. As Tsukamoto scores the winning goal, he realizes that he thoroughly enjoys soccer, as well as playing alongside Kazama. Inspired by Kazama, Tsukamoto decides to join him in the school's soccer club. Little does he know, the Seiseki team is renowned nationwide, and a terrible player like him might not even pass the selection process, let alone play in the first team. Even so, Tsukamoto forces his way into Seiseki with the only thing he is good at—running straight ahead! 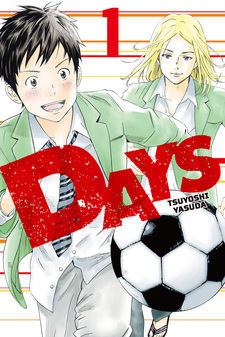 Days has been published digitally in English by Kodansha Comics USA since April 25, 2017. 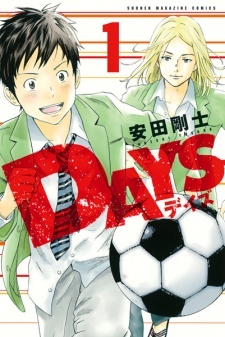 Adaptation: Days (TV), Days (TV) OVA, Days (TV): Touin Gakuen-sen! I know this manga has not been fully scanlated yet (last time I checked only first volume) but I just bought all released volumes yesterday and I am in thirst of talking about how satisfied I am with DAYS. For the start, I am indeed a fan of Yasuda Tsuyoshi's (especially Over Drive *sob*) works, but soccer really never become my thing. I did following some soccer series in the past, however only Giant Killing and this series that was able to give me a real enjoyment of the sport. On the beginning you might think that the premise is not that original and some of the elements were already done by some manga in the pasts. However, I think the one who made me can't stop reading it is the characters (and its development). Tsukushi the main character, with support from eccentric and sport-genius Kazama, seems started as a typical weak and small MC which later surprisingly growing into a realistic outstanding player. And 'outstanding' here does not means that he has to be good in soccer; he got his own way. He is seriously a fresh character, who has a unique trait that can motivates his team mates. He is not that much of help, but the team needs him. And it does not look odd at all. The Seiseki soccer club is of course a bunch of genius players, but they are also really stupid and hilarious. Moreover, each of them got relatively enough show time to make you feel attached to them. And unless you care, all the guys are good-looking, just not in the bishounen way. I would not say anything about the art. It's perfect. And yes, I really recommend you to start reading this and let's hope that the scanlation will be a lot more active soon.